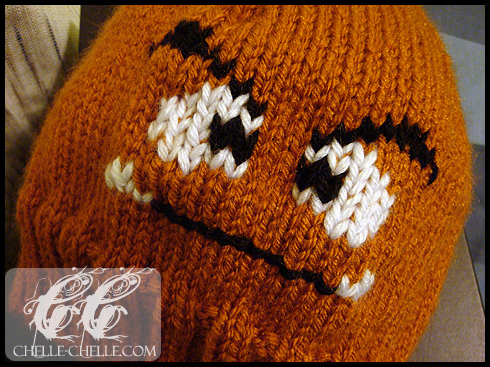 Chelle-Chelle.com – Crochet, Knit, Craft » More Goomba! A while ago, I’m not even sure how long ago now, I knitted a hat. It wasn’t my first time knitting in the round, but I did this one entirely on double-pointed needles. It was my first ‘big’ circular knitting project that I did, besides little testing swatches to get used to it. I used all worsted weight yarn, all Lion Brand Wool-Ease (80% acrylic, 20% wool). I used an acrylic blend because the hat was a gift and if I’m not entirely sure about someone’s laundry habits, I tend to gift acrylic or acrylic blends. It’s not because I’m selfish when it comes to the “good yarn” (well, maybe I am), but because it’s just good practice. I don’t want to make something for someone and then have them toss it into the wash and have it come out several sizes too small. That wouldn’t do me or the gift recipient any good if the hat was easily ruined, now would it? 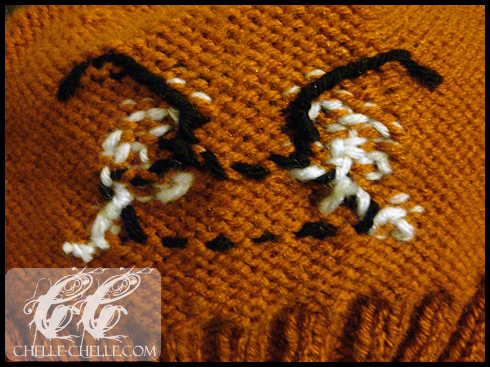 I used a basic toque pattern and did it entirely in the base colour first. 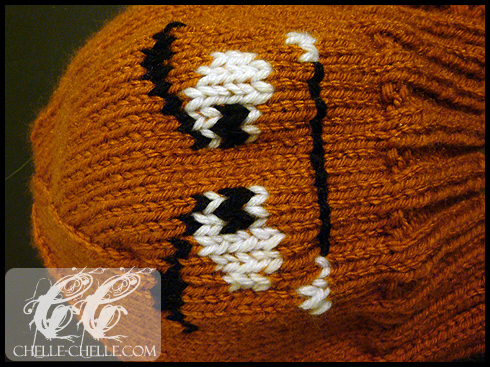 Goomba’s face was duplicate stitched on afterwards. I tried to make the inside as neat as possible, but not sure if I managed that at all. It was a pretty decent knit, the thing that I really needed to get into the habit was shuffling stitches on the dpns, I was not used to that at all.